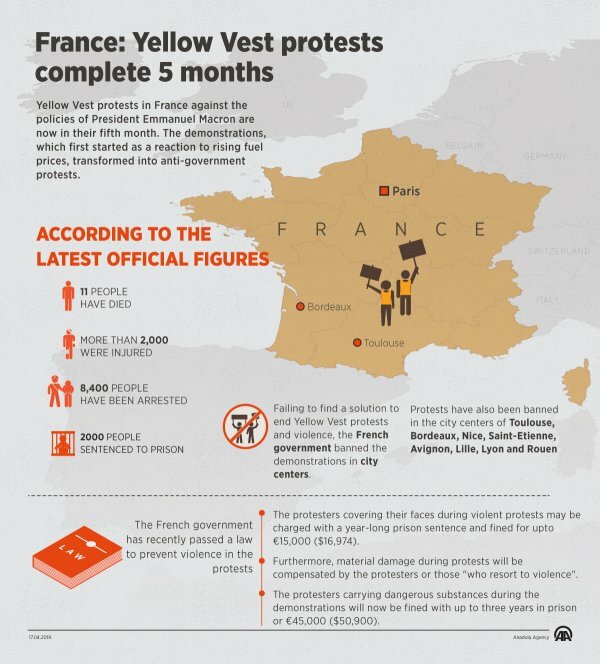 Yellow Vest protests in France against the policies of President Emmanuel Macron are now in their fifth month. The demonstrations, which first started as a reaction to rising fuel prices, transformed into anti-government protests. The protesters are looking forward to an address to the nation by Macron on the economic conditions of France, which was postponed in the aftermath of a fire which gutted the Notre Dame cathedral in Paris. In a Tuesday statement, Macron said he would soon deliver his speech, but the protesters claim he will not be able to convince them. 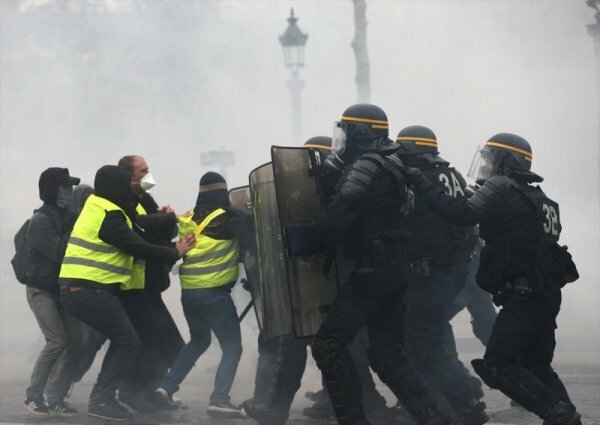 Failing to find a solution to end Yellow Vest protests and violence, the French government banned the demonstrations in city centers. 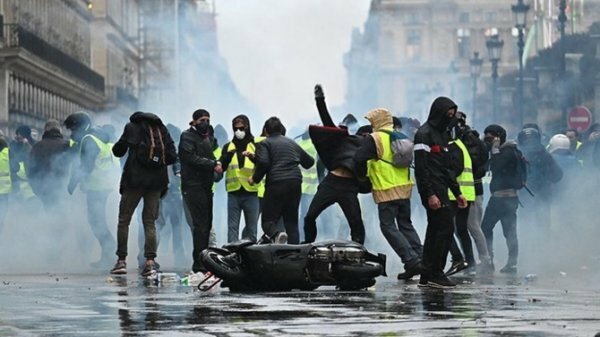 The main reason for the ban was the March 16 protest in Champs-Elysees Avenue in which rocks were hurled at policemen, roadblocks were set on fire, and several restaurants and shops were looted. In addition, 192 people were detained and 42, including 17 policemen, were injured during these protests. The French government later announced that 91 shops and restaurants and shops were plundered and material damage amounted to some €200 million ($226 million). Protests have also been banned in the city centers of Toulouse, Bordeaux, Nice, Saint-Etienne, Avignon, Lille, Lyon and Rouen. 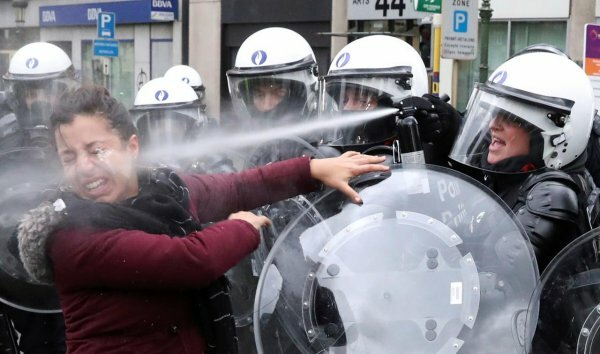 The French police used pepper spray against protesters last week, eventually arresting 15 people. Also, the protestors in Toulouse ignored the ban and set fire to a vehicle. Police resorted with pepper spray and arrested 43 people. 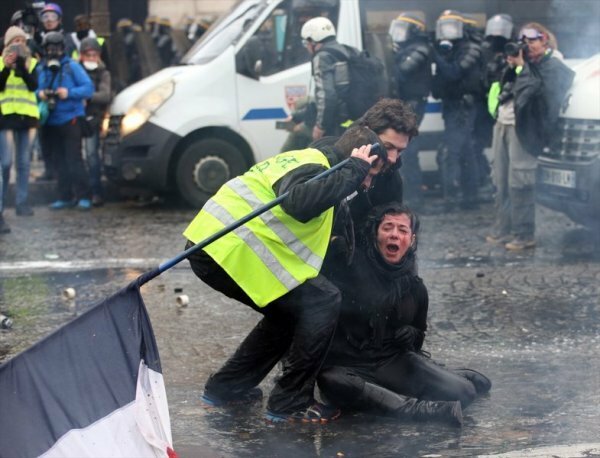 The French government has recently passed a law to prevent violence in the protests. 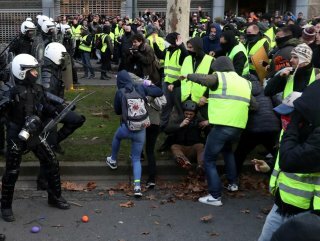 The protesters covering their faces during violent protests may be charged with a year-long prison sentence and fined for upto €15,000 ($16,974). Furthermore, material damage during protests will be compensated by the protesters or those "who resort to violence". In line with the law, police were authorized to frisk the protesters before demonstrations and judges now can prohibit those on probation to participate in the protests. The protesters carrying dangerous substances during the demonstrations will now be fined with up to three years in prison or €45,000 ($50,900). 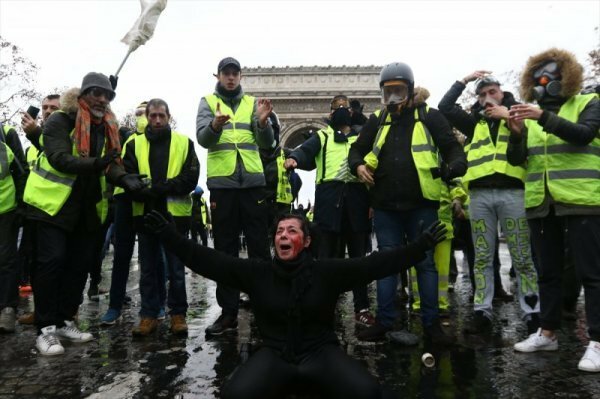 Yellow Vest protests have been ongoing since Nov. 17, 2018. According to the latest official figures, 11 people have died so far and more than 2,000 were injured. More than 8,400 people have been arrested and 2,000 people sentenced to prison. According to French Mediapart website, 11 people were killed, five had their hands ripped due to pepper spray, and 21 lost their eyesight.